Another eagerly anticipated Cardiff restaurant launch has happened recently, in the shape of Wahaca, a predominantly London-based chain offering Mexican Market Eating. Mr W and I went along to their first restaurant outside London (well, they’ve got one in Bluewater) to try their offering for ourselves. The new location is on in St David’s 2 on the Hayes, which is seeing a proliferation of new eating venues, led by the recent arrival of Miller & Carter, and soon to be joined by Burger & Lobster. It covers three floors – the third housing a bar, complete with fussball table – and is brightly decorated with an industrial feel (think exposed metal ceilings, scaffolding bars along the walls etc.) I couldn’t help but think of Jamie’s Italian in terms of the layout, as the units are (unsurprisingly) very, very similar. The night we went, the place had a buzzing atmosphere and seemed to have a high turnover of customers with a lot of people seeming to pop in for a quick bite to eat after shopping, and others staying a little longer. We had a table on the first floor mezzanine, overlooking the restaurant downstairs. Our immediate observation was that the tables were incredibly close together. It was a real squeeze to get between the two to get to the banquette seats against the wall, and because of the noise levels in the restaurant, diners had to speak loudly to each other so there was no avoiding other people’s conversations. It’s certainly not the place for a romantic evening or a confidential conversation! This probably would have been less noticeable if we’d been in a big group, but with just two of us, I did find it a bit off-putting, and once we’d finished our food, we weren’t inclined to linger over a drink or a coffee. 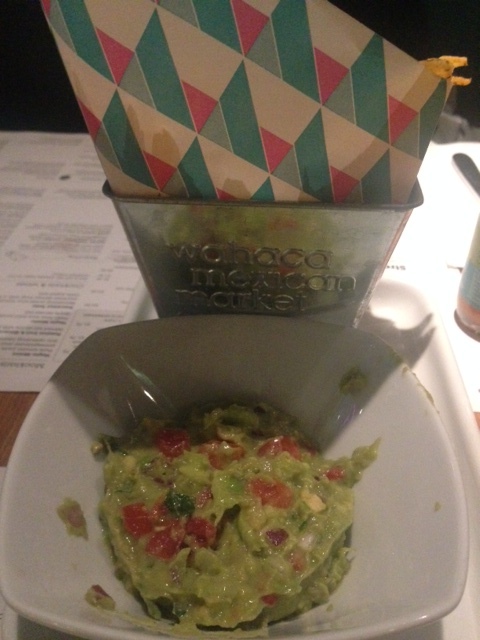 Food wise, we started with some homemade guacamole from the ‘nibbles’ menu, whilst we perused the extensive menu. We had these with tortilla chips (although there was an option of pork scratchings!) 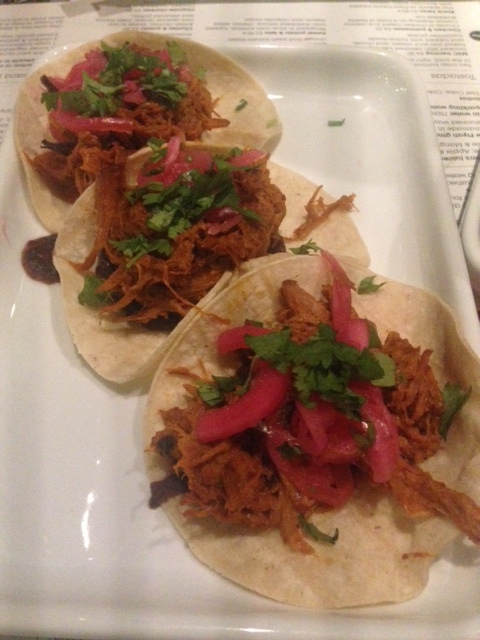 and it was a great start: very fresh, with good flavours, and on a par with guacamole I’d make myself at home. Although there are ‘big plate’ options, we decided to try a selection of the Mexican Market Food – smaller dishes for sharing. We went for three each, with a couple of sides. Quantity-wise, this was about right for us, but did prove a bit of a logistical nightmare on our table, albeit they have gone with oblong plates which does make it slightly easier. Our meal was a mixed bag. 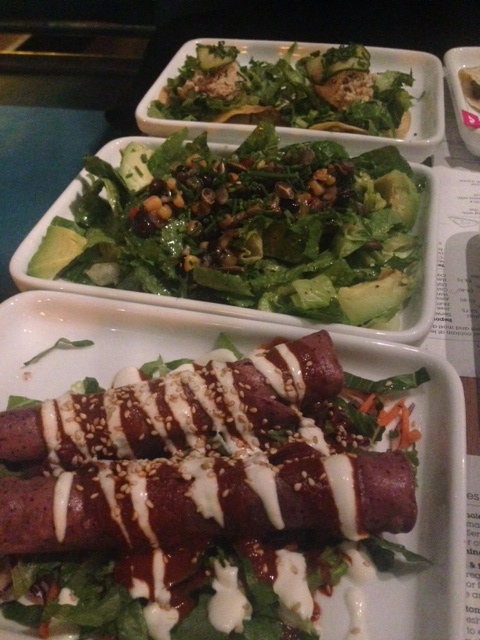 My favourite was the duck taquitos, which was confit duck leg in crispy blue corn tortillas, with a mole sauce. This was tasty without being overpoweringly spicy. I particularly disliked the herring tostadas as I didn’t like the taste or texture of the herring mixture. Mr W liked the flavour, but found eating them a logistical challenge due to the crispy tostada base. 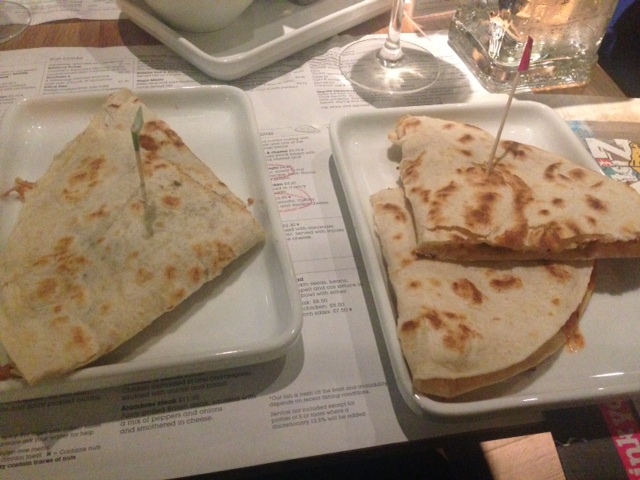 His favourite was the chorizo and potato quesadillas, which were definitely tasty, although personally I found potato in a quesadilla a bit odd. I also enjoyed the pork tacos, and the side order of sweet potato fries went down particularly well with me, especially when dipped in some of the guacamole left over from our starter. I have to hold my hands up here and say that Mexican food really isn’t a favourite with me. I don’t mind it, but I’d never really choose to eat Mexican, and I find it quite samey. That said, I enjoyed some of the dishes we had, and I liked the fact there was more variety and creativity in the dishes than other places I’d been – where it seems to just be the same food with the tortilla folded differently. Mr W is similarly disinclined towards Mexican food, but enjoyed Wahaca much more than Mexican food he’d actually eaten in Mexico, so this was pretty good going! 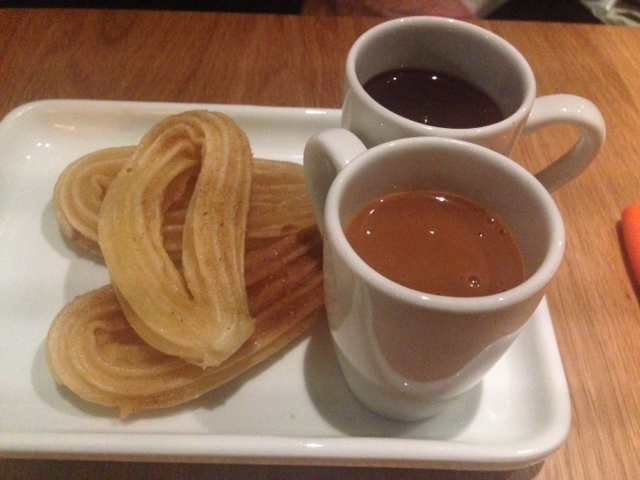 We couldn’t resist a pudding: Mr W went for churros, served with a chocolate dipping sauce (and a bonus helping of caramel sauce, which I finished off with a spoon after he’d run out of churros to dip!) The churros were not as fresh as ones we’ve had from street food outlets, but they were hot and crispy anyway. A bit of a stingy portion, though. 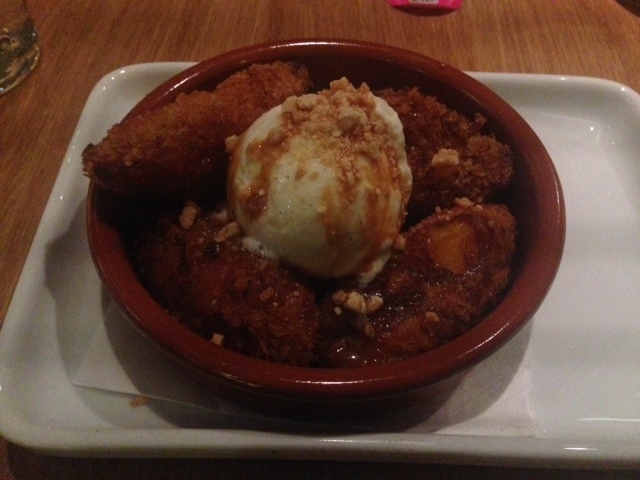 I chose plantain fritters, which were served with vanilla ice cream, caramelised nuts and dulce de leche. This was a really good dessert and probably the highlight of my meal. 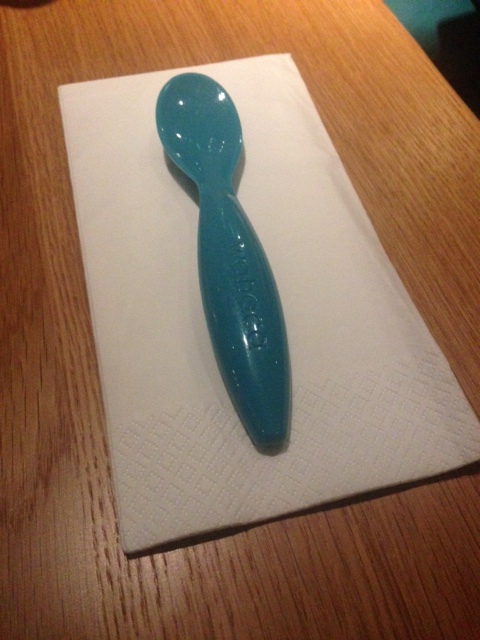 The puddings, though, were served with bizarre child-like spoons, which were probably meant to be quirky and fun, but I just found them irritating, especially when trying to slice through a plantain fritter with one. A special mention also goes to a drink I tried (in the absence of being able to try one of the extensive selection of cocktails, tequilas and mescals on offer, as I was sadly driving): Horchata, a dairy free blend of rice and almond milk with cinnamon to flavour it. This was delicious and refreshing, and helped to cool my mouth down after a fairly spicy selection of main dishes. The service in the restaurant deserves an even more special mention. Every staff member we came across was helpful, cheerful and incredibly enthusiastic about the food – not to mention knowledgeable about everything on the menu, which is really good going considering they’ve only been open a short time. That added to the positive vibe and buzzy atmosphere in the restaurant. When somewhere is as big and busy as Wahaca, it’s easy for staff to seem stressed and unhappy, but none of them did. I think Wahaca will be a huge success in Cardiff and I can see it being very popular with large groups who want to combine a fun food experience with a few cocktails or tequilas in the bar or at their table. I also like the fact that they seem to have a strong focus on being a responsible business, with charity donations and commitment to sustainable, ethical and locally produced food. I do see it appealing to a very similar market to the aforementioned Jamie’s Italian. 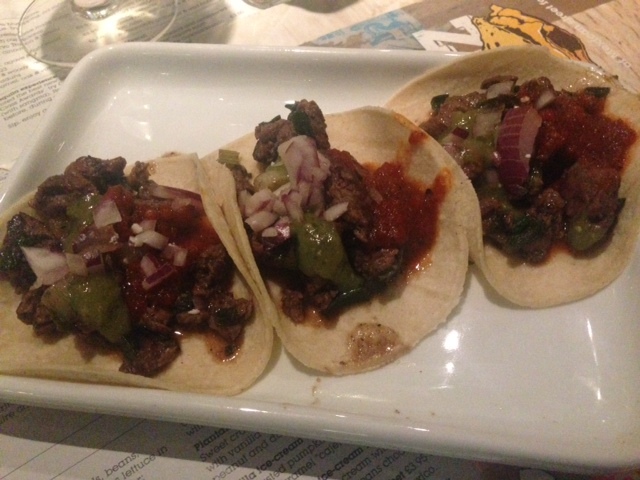 The food was creative and a bit different, and pretty tasty, and I’m sure that for lovers of Mexican food it will be a great destination and a welcome alternative to the plethora of Italian chains in the area. I’ve heard others raving about it who have visited, and I’ve also got several friends who were already fans of the London destinations, so I have a feeling I’m in a minority by not being bowled over by Wahaca’s food and set up. I’d definitely go back again to try the cocktails, and I wouldn’t be able to resist the guacamole if I did – it would surely be rude not to finish off with some plantain fritters too! 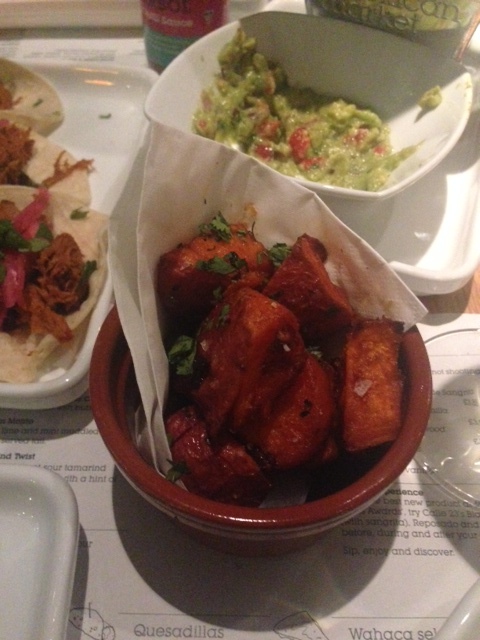 I was invited to Wahaca as a guest and as such our food and drink was complimentary.